Among all the fascinating web components we can found in any UI, forms are usually the most boring part. In the past, there used to be only a few text input elements, where the user had to enter the data manually. Then with HTML5 things improved a lot, since new types of input appeared, such as color, date and range, among many others. Although functionally these new types of input works, we can say that they often do not meet the aesthetic needs of web applications, then many proposals have emerged to replace these elements and achieve a better appearance, and looking almost identical in all modern browsers. This original animation, which we have used as inspiration, can be found on this dribble shot by Stan Yakusevich. Above is the final product we&apos;ll make. Let&apos;s start! 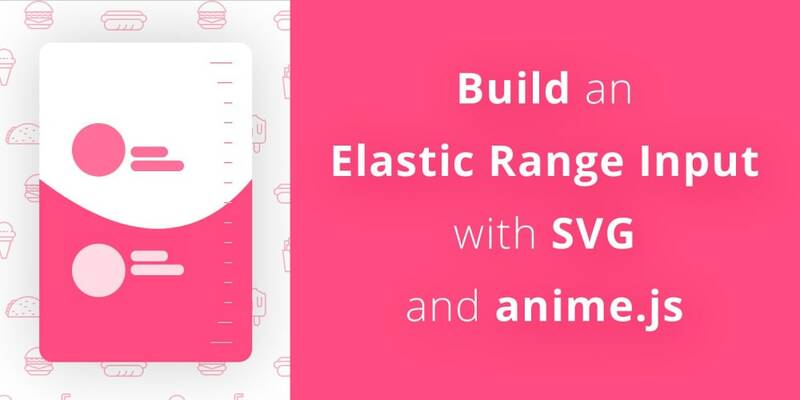 If this is the first time you use the SVG path element or you don&apos;t understand how they work, you can learn more in this excellent tutorial in MDN. As you can see, the HTML code is quite easy to understand if we follow the comments. Now let&apos;s look at the styles. As you can see, apart from the basic styles to achieve a proper appearance and centering the element, we have disabled the user&apos;s ability to select anything within our component. This is very important, since we will implement a "drag and drop" type interaction, and therefore if we allow the "select" functionality, we can get unexpected behaviors. Now let&apos;s see the main styles used for the values. Here the transform-origin property plays an essential role to keep the numbers aligned with the text in the desired way, as in the original animation. First, let&apos;s see the code needed to simulate the drag and drop functionality, listening to corresponding events, doing maths work and perform animations. Please note we are not including the whole code, but only the fundamental parts to understand the behavior. dy: distance in the y axis that mouse has been moved since the mousedown or touchstart event. ty: distance in the y axis that the path must be translated. As you can see, it was necessary to implement two consecutive animations to achieve an exaggerated elastic effect, similar to the original animation. This is because a single animation using the elasticOut easing function is not enough. You can check the final result, play with the code on Codepen, or get the full code on Github. Please note that to make the tutorial a bit more fun and easy to follow, we have not explain here every single line of code used. However, you can find the complete code in the Github repository. We sincerely hope that you liked the tutorial, and it has served as inspiration!